Do you know that what you’re experiencing now may have been a result of your past life? Are you willing to make that “correction” in order to change the course of your destiny? These questions may seem impossible to answer but to Kabbalistic astrologer, Yael Yardeni, the only question is: Are you ready to know the answer? Yardeni’s “gift” to read the past and chart the future has made her one of the most sought-after astrologers in the world --- the waiting period for a chart reading with Yael can be up to six months or more. Yael is a Kabbalistic Astrologer and astrology teacher with an international reputation, practicing for the past 12 years. Her readings are grounded on the principles and teachings of Kabbalah, an ancient spiritual wisdom that speaks of free choice and the ability of each person to rise above their circumstances. Yael Yardeni was born and educated in France, studying mathematics, physics, and finally continuing into medical studies. In 1987, she met Rav and Karen Berg, the Kabbalah Centre's founders and soon after, changed her direction in life, choosing to leave the field of medicine to begin her study of Kabbalah. Since then, together with her husband, Eliyahu, Yael has founded Kabbalah Centres in France, London, and Miami, and has taught in Los Angeles and Hong Kong. Through her astrological chart readings, Yael connects thousands to their purpose in life, based on her astrological chart readings. 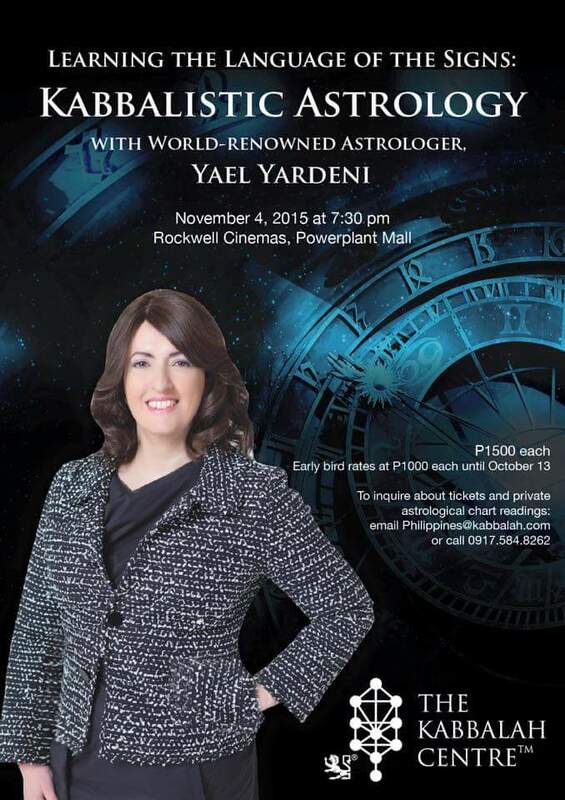 Now, Filipinos need not wait that long as Yardeni will be coming to Manila for a talk “Learning the Language of the Signs: Kabbalistic Astrology with Yael Yardeni” to be followed by-appointment-only private readings on November 4, 2015. Upon the invitation of Kabbalah Centre Philippines (KCP) Yardeni’s visit will be coming to Asia just to visit the Philippines – and for a very compelling reason. “We are proud to say we are the biggest and perhaps busiest Kabbalah Centre study group in all of Asia,” says Sarah Weston, Filipina Kabbalah teacher residing in London who heads KCP. Yardeni’s Manila engagement is also seen as fortuitous given that the country is preparing for the Presidential elections next year. “Expectations are riding high on every candidate -- there is a desire for change. Yael can give us insight on the change in consciousness each of us needs to manifest to ensure that the Philippines stays on its trajectory towards growth – as we are all collectively responsible,” explains Weston. Kabbalah is a universal wisdom that can be studied by anyone regardless of their faith or path. It pre-dates the Bible and religion. Presenting the wisdom from a lineage of kabbalists, the Kabbalah Centre provides a course of study that describes the physical and spiritual laws of the universe, including human existence and the journey of the soul. With the use of Kabbalistic tools, students can improve the quality of their lives and move towards lasting joy and fulfillment. On a literal level, the word Kabbalah means “receiving.” It is the system by which we achieve true fulfillment in life. Yael Yardeni was born and educated in France, studying mathematics, physics, and finally continuing into medical studies. In 1987, her cousin introduced her to Rabbi Berg and his wife Karen Berg, the Kabbalah Centre's founders. Upon her discovering of the secrets of Kabbalah and her meeting the Rav and Karen, Yael changed her direction in life, and chose to leave the field of medicine to begin her study of Kabbalah. Her chart readings are in no way conventional. Yael has a wide and extensive knowledge on the subject, as well as degrees in hypnotic therapy, clinical hypnotic therapy, and past life regressions.